Some time ago I received a parcel from Taiwan. A company called Mobile Action asked me if I wanted to write a blog-review about their new GPS-Logging solution. They do not only sell the GPS-receiver (called i-gotU), they also provide a software (called @trip PC) to combine the pictures with the GPS-data and an online-platform (called @trip) to upload your GPS-tracks and pictures. 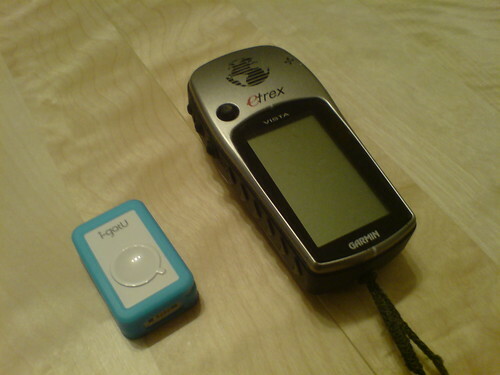 The i-gotU GPS-receiver is obviously smaller than the Garmin Etrex Vista (which I wrote an article about some time ago). The software automatically detects the i-gotU and you can import the GPS-data. The import of the photos from the camera also is a smooth process. The software automatically connects the GPS-data and the pictures and presents them on a Map. The whole process of importing GPS-Data, connecting it to the pictures and uploading it to the web is as easy as possible. If you push play you can experience the way that I went. The i-gotU is small and water-resistant. You can directly upload photos to flickr or picasaweb while uploading your trip, which is great! It's cheap at about $60. The software only runs on Windows, so you need a PC or a virtual machine like VMWare or parallels. I used VMWare Fusion.